Our June meeting will be at our usual date and location on the third Saturday (June 21, 11 am) at the Humanist Center in Tempe. Dr. Dave Williams will talk about “Exploring the Solar System”, which is an overview of the NASA missions exploring destinations throughout the solar system. Dr. David A. Williams is an Associate Research Professor in the School of Earth and Space Exploration at Arizona State University, Tempe, Arizona. Dr. Williams is the Director of the Ronald Greeley Center for Planetary Studies, the NASA Regional Planetary Information Facility at ASU. He is also the Director of the NASA Planetary Aeolian Laboratory at the Ames Research Center in California. David is currently performing research in volcanology and planetary geology, with a focus on planetary mapping, geochemical, and remote sensing studies. His research has included computer modeling of seismic wave propagation through planetary interiors, visible and near-infrared spectroscopy of the lunar surface, planetary geologic mapping of the satellites of Jupiter, the planet Mars, and the asteroid Vesta, computer modeling of the physical and geochemical evolution of lava flows in a variety of planetary environments, and petrologic study of lava samples from Mount St Helens. He was involved with NASA’s Magellan Mission to Venus and Galileo Mission to Jupiter. He is a Co-Investigator on the European Space Agency’s Mars Express orbiter mission, and he was a Participating Scientist on NASA’s Dawn Mission to asteroid Vesta. David is a Past Chair of the Planetary Geology Division of the Geological Society of America, and has served on several NASA committees including a five-year term on the NASA Outer Planets Advisory Group. Mike Mackowski will also give a report on my trip to LA to attend the NSS’s International Space Development Conference, as reported elsewhere on this blog. The long-term goal for the majority of space enthusiasts is to get people to Mars. Advocates acknowledge this is an ambitious goal that will be expensive and not without risk. Over the past few years several very different proposals on how to get there have been offered. At this month’s meeting Mike Mackowski will review these various options and discuss their pros and cons. Mike is president of the Phoenix Chapter of NSS, an aerospace engineer, and a long time space advocate. The audience will be invited to offer their views on the pathways to Mars and we hope this can be a fun and interactive discussion. The presentation will not just consider how to get to Mars but why. Space advocates often run into the same questions about why we should send people into space at all. Many reasons have been offered (international prestige, inspiration, exploration, commercial development, settlement, etc.) but which one will be the driver that final puts footprints in the Martian dirt? How can we make it permanent and not just “flags and footprints”? What will be the relative roles of government and private entities? There has also been a lot of debate recently on what should be the next “destination”. Do we need to stop at the Moon first? Can asteroids be a practice run before attempting the deep space mission to the Red Planet? Can we use resources from the Moon or an asteroid to reduce the cost of the mission? to go next (Moon, Mars, asteroids) has heated up and is even dividing the pro-space community. So I collected my notes and reviewed some news articles and commentaries and came up with the chart you see here. Please plan to join us at this meeting. Mike will offer his views on the subject and is looking forward to getting inputs from other people excited about the prospects of manned space exploration. Let’s assume that the ultimate goal is to get people to Mars. The purpose of the chart is to consider how we accomplish that. And why. What are the options along the way? Do we need to go somewhere else first? How can we make it permanent and not just “flags and footprints”? What sort of space technology do we need? The chart does not pretend to give any answers and it certainly is not all-inclusive. It simply tries to lay out the main issues that have been debated recently and offer some quick evaluation of the various factors involved. That evaluation, unfortunately, is not very optimistic. 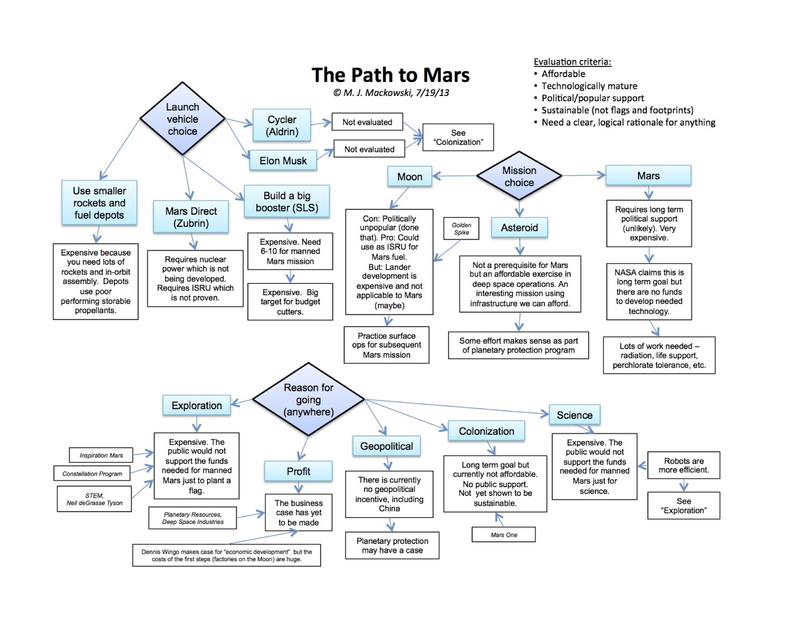 Considering the three main issues (where, how, and why), I don’t see an easy path to Mars at all. Space travel is difficult and expensive to begin with, and when you look at the obstacles to making any option workable, it’s not a pretty picture. On the bright side, private entities are serious about exploring and utilizing space. In the past, governments were the only institutions with the resources to do that. With better technology, commercial firms are now approaching the capabilities that were once only available to government institutions. Still, someone like Elon Musk alone could not have funded the entire Apollo program, so space enthusiasts should not have unrealistic expectations. It’s going to take a lot of patience, but there is hope out there. Comments and feedback on the graphic are welcome. Demonstrate the technical maturity of tactically relevant railgun technologies in a proving-ground environment. GA accomplished both of these objectives by demonstrating the launcher and power system technologies to full design levels in 2009 during testing with non-aerodynamic rounds, followed by testing of aerodynamic rounds during the fall of 2010. The tests demonstrated the integration and capabilities of a tactically relevant EM Railgun launcher, pulsed power system, and projectile. The projectiles were launched by Blitzer at Mach 5 with acceleration levels exceeding 60,000 gee, and exhibited repeatable sabot separation and stable flight. Is the US Navy Preparing to Conquer Space? 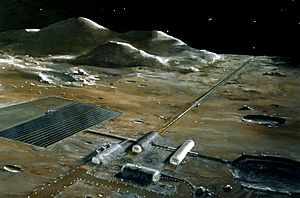 Lunar base with a long electromagnetic track for a mass driver. Colonizing space will require a lot of stuff, iron to build space stations, titanium to build spaceships, oxygen for us to breathe, and many other resources. Lifting all this up from the surface of the earth on rockets is simply not feasible. Thus, we will need to find these resources somewhere else. You need look no further than the moon. It has all the natural resources we need to colonize space but the question remains, how do we get them into orbit? Even on the moon, rockets are not feasible, but something else might be. An idea emerged over a century ago called a mass driver. The first mass driver described in print was in the 1897 science fiction novel A Trip to Venus by John Munro. He called it an electric gun. It was his imaginative method of launching vehicles into outer space from the Earth’s surface. Munro describes the electric gun as a series of coils energized in a timed sequence to provide the force necessary to get the spaceship into orbit. The image was captured by Curiosity’s Mars Hand Lens Imager (MAHLI). The DRT is a motorized wire-bristle brush on the turret at the end of the rover’s arm. By the middle of December, Curiosity had reached the Glenelg region of Gale Crater and descended into the Yellowknife Bay depression. 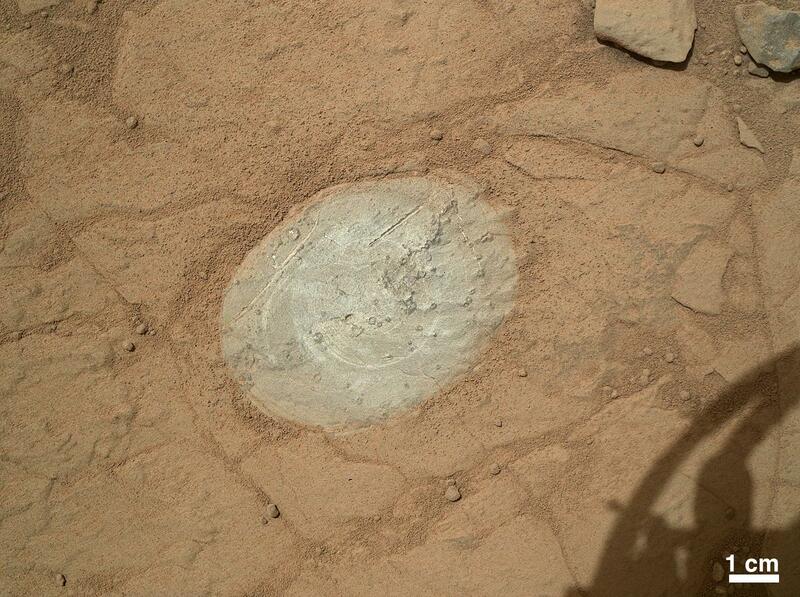 Curiosity is now exploring for the first target rock for it’s hammering drill. 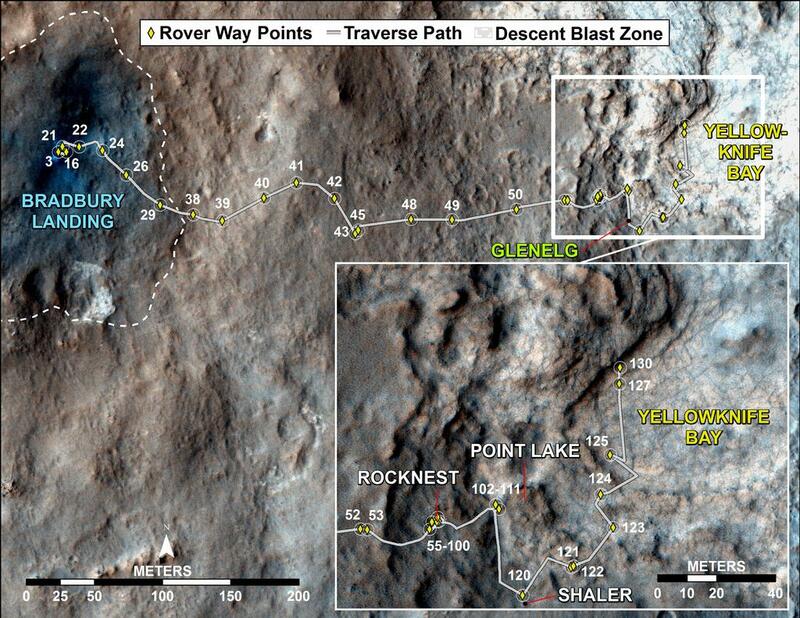 After leaving Bradbury Landing, Curiosity spent extensive time at Rocknest (Sols 55-100), and followed this with investigations around Point Lake (Sols 102-124).